The job of Actuarial Analyst is challenging and requires hands-on experience in the fields of insurance and investment sectors. The role demands exclusive educational qualification in subjects like finance, law or insurance. 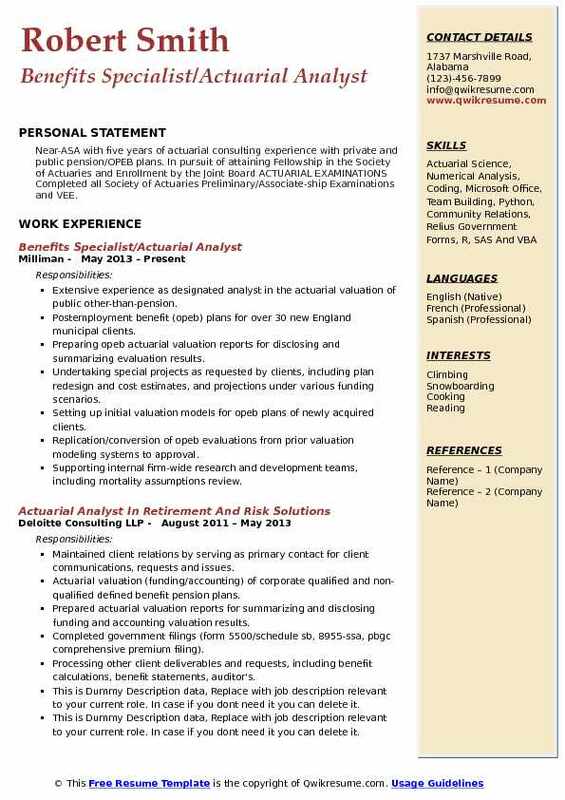 The Actuarial Analyst Resume should include the key skills of finance expertise, analytical thinking, risk management techniques, managerial skills, team player and, communication skills. A professional Actuarial Analyst provides customized risk management and risk financing solutions to their customers. The job responsibilities of a typical Actuarial Analyst are analyzing all the risk factors of an investment plan and helping customers in the management of such risks. They analyze the risks arising due to uncertainty and variability of the investment returns to feed the investment decisions of the customers. 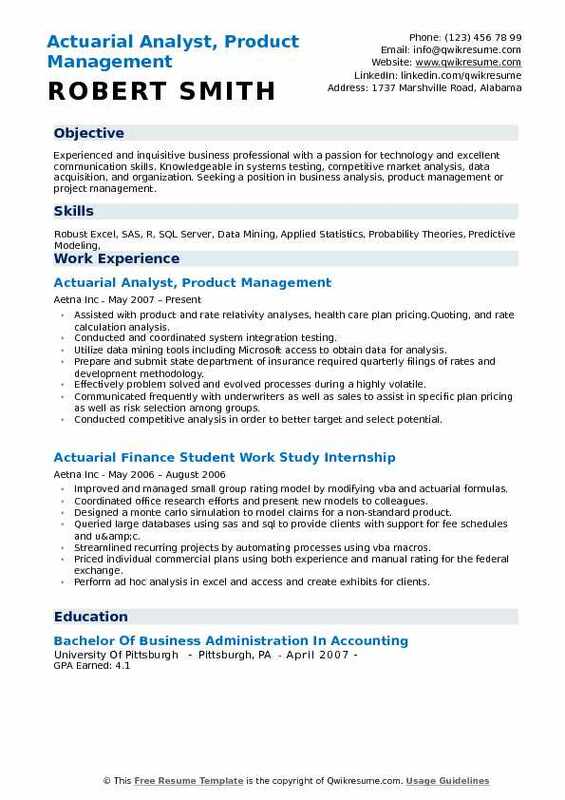 Follow our objectives and sample resume to draft your profile that should encompass the required key skills and responsibilities of an Actuarial Analyst. 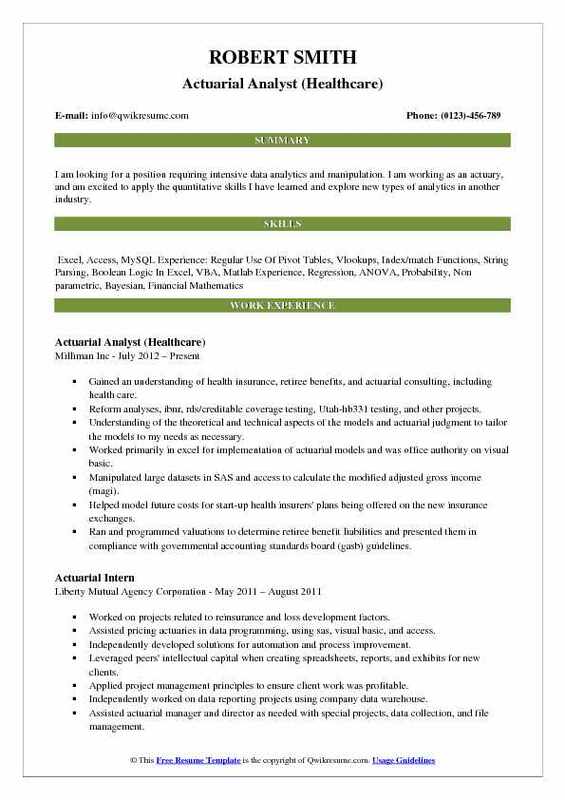 Headline : Seeking a position to effectively apply statistical and analytical background in order to evaluate the risk borne by a company and its financial impact. 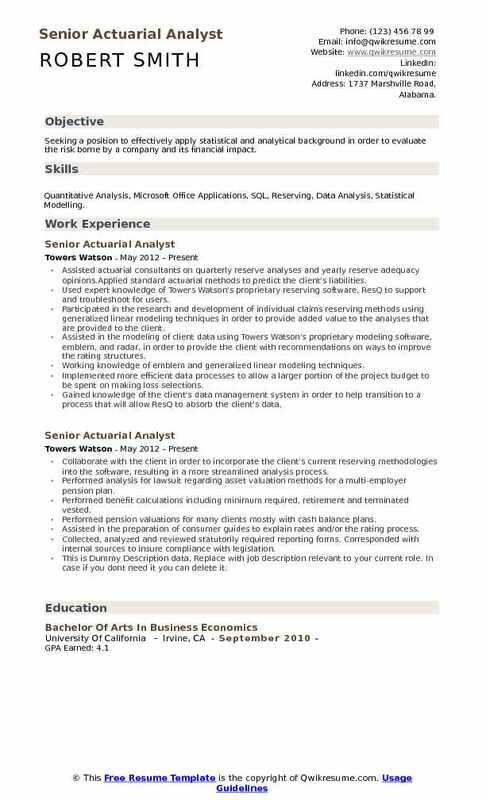 Skills : Quantitative Analysis, Microsoft Office Applications, SQL, Reserving, Data Analysis, Statistical Modelling. Assisted actuarial consultants on quarterly reserve analyses and yearly reserve adequacy opinions.Applied standard actuarial methods to predict the client's liabilities. Used expert knowledge of Towers Watson's proprietary reserving software, ResQ to support and troubleshoot for users. Participated in the research and development of individual claims reserving methods using generalized linear modeling techniques in order to provide added value to the analyses that are provided to the client. Assisted in the modeling of client data using Towers Watson's proprietary modeling software, emblem, and radar, in order to provide the client with recommendations on ways to improve the rating structures. Working knowledge of emblem and generalized linear modeling techniques. Implemented more efficient data processes to allow a larger portion of the project budget to be spent on making loss selections. Gained knowledge of the client's data management system in order to help transition to a process that will allow ResQ to absorb the client's data. 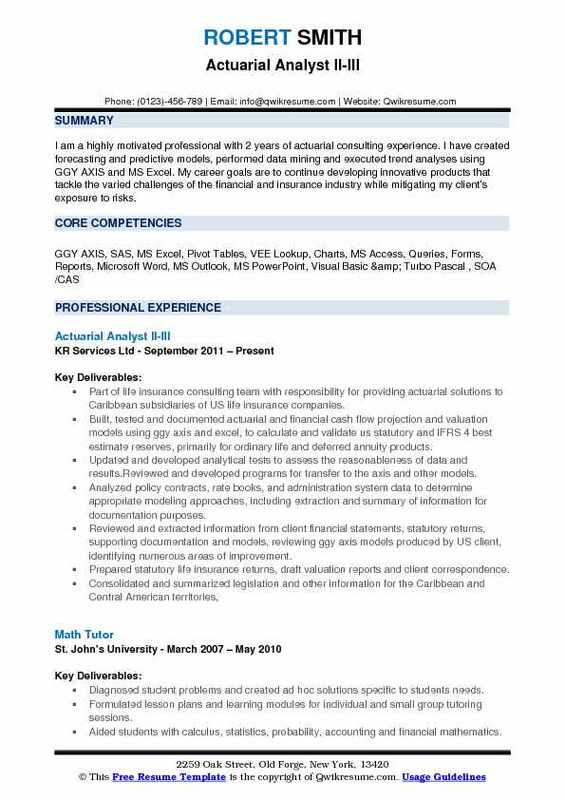 Summary : I am a highly motivated professional with 2 years of actuarial consulting experience. I have created forecasting and predictive models, performed data mining and executed trend analyses using GGY AXIS and MS Excel. My career goals are to continue developing innovative products that tackle the varied challenges of the financial and insurance industry while mitigating my client's exposure to risks. Part of life insurance consulting team with responsibility for providing actuarial solutions to Caribbean subsidiaries of US life insurance companies. Built, tested and documented actuarial and financial cash flow projection and valuation models using ggy axis and excel, to calculate and validate us statutory and IFRS 4 best estimate reserves, primarily for ordinary life and deferred annuity products. Updated and developed analytical tests to assess the reasonableness of data and results.Reviewed and developed programs for transfer to the axis and other models. Analyzed policy contracts, rate books, and administration system data to determine appropriate modeling approaches, including extraction and summary of information for documentation purposes. Reviewed and extracted information from client financial statements, statutory returns, supporting documentation and models, reviewing ggy axis models produced by US client, identifying numerous areas of improvement. Prepared statutory life insurance returns, draft valuation reports and client correspondence. Worked with bond valuation models to support best estimate interest rate vectors and valuation of distressed bonds as part of solvency testing. 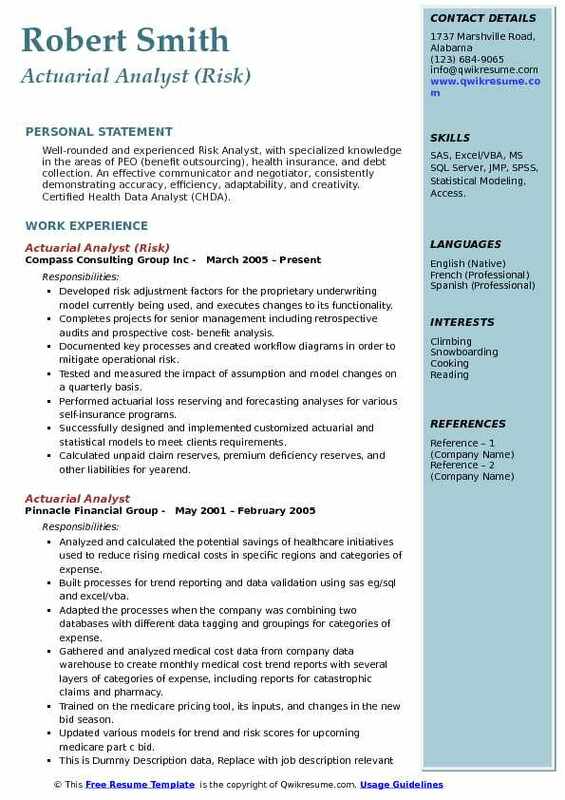 Summary : 3 years working experience in health insurance industry, familiar with financial reporting process, forecasting, modelling and data mining strategies. Solid background in mathematics and statistics, good quantitative and problem solving skills. Strong computational skills: programming and software use. Provide data and perform actuarial calculations to support Oregon and Alaska provider negotiations.. Prepare various ad hoc analysis to support provider negotiation as well as peer review work for other analysts. Produce and present analytical reports on provider reimbursements, trends and performance for internal and external clients. Coordinate with health care delivery systems (hcds) and operations on a daily basis to support provider. Monitor and interpret data trends to analyze and explain results to provider network executives.Prepare and deliver quarterly reports and annual reconciliations for assigned global outcomes contracts (goc). Prepare and maintain documentation for the production of standard reporting processes and procedures. Designed and produced a model that calculated the cost relativity of health plans based on limited or provider centric networks. Headline : I am looking for a position requiring intensive data analytics and manipulation. I am working as an actuary, and am excited to apply the quantitative skills I have learned and explore new types of analytics in another industry. Gained an understanding of health insurance, retiree benefits, and actuarial consulting, including health care. Reform analyses, ibnr, rds/creditable coverage testing, Utah-hb331 testing, and other projects. Understanding of the theoretical and technical aspects of the models and actuarial judgment to tailor the models to my needs as necessary. Worked primarily in excel for implementation of actuarial models and was office authority on visual basic. Manipulated large datasets in SAS and access to calculate the modified adjusted gross income (magi). Helped model future costs for start-up health insurers' plans being offered on the new insurance exchanges. Ran and programmed valuations to determine retiree benefit liabilities and presented them in compliance with governmental accounting standards board (gasb) guidelines. 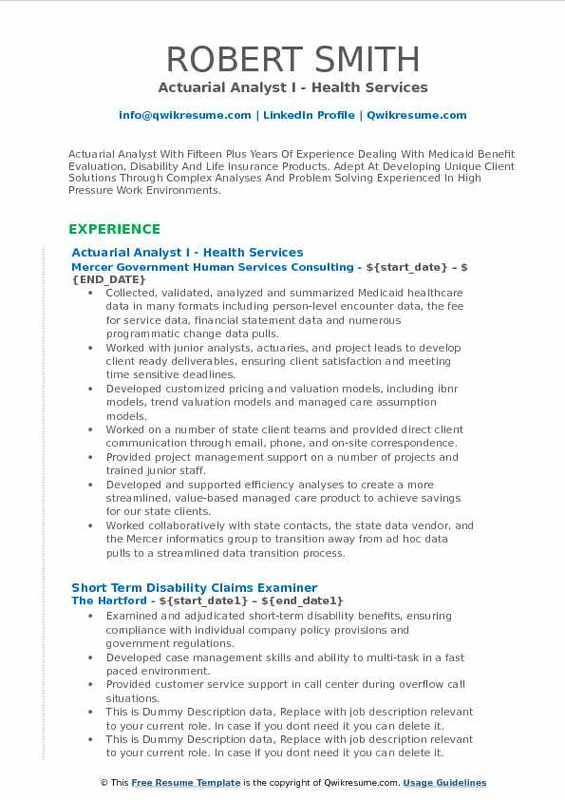 Summary : Actuarial Analyst With Fifteen Plus Years Of Experience Dealing With Medicaid Benefit Evaluation, Disability And Life Insurance Products. Adept At Developing Unique Client Solutions Through Complex Analyses And Problem Solving Experienced In High Pressure Work Environments. Collected, validated, analyzed and summarized Medicaid healthcare data in many formats including person-level encounter data, the fee for service data, financial statement data and numerous programmatic change data pulls. Worked with junior analysts, actuaries, and project leads to develop client ready deliverables, ensuring client satisfaction and meeting time sensitive deadlines. Developed customized pricing and valuation models, including ibnr models, trend valuation models and managed care assumption models. Worked on a number of state client teams and provided direct client communication through email, phone, and on-site correspondence. Provided project management support on a number of projects and trained junior staff. Developed and supported efficiency analyses to create a more streamlined, value-based managed care product to achieve savings for our state clients. Worked collaboratively with state contacts, the state data vendor, and the Mercer informatics group to transition away from ad hoc data pulls to a streamlined data transition process. 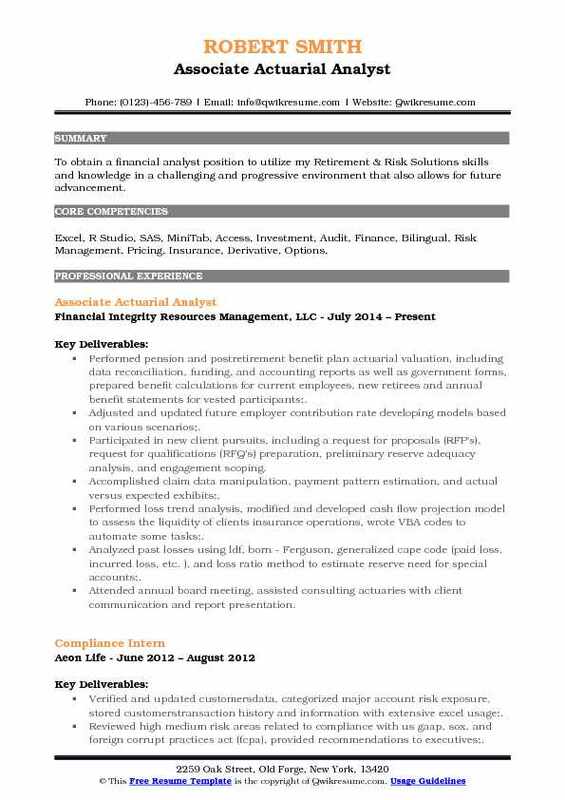 Summary : Well-rounded and experienced Risk Analyst, with specialized knowledge in the areas of PEO (benefit outsourcing), health insurance, and debt collection. An effective communicator and negotiator, consistently demonstrating accuracy, efficiency, adaptability, and creativity. Certified Health Data Analyst (CHDA). Skills : SAS, Excel/VBA, MS SQL Server, JMP, SPSS, Statistical Modeling, Access. Developed risk adjustment factors for the proprietary underwriting model currently being used, and executes changes to its functionality. Completes projects for senior management including retrospective audits and prospective cost- benefit analysis. Documented key processes and created workflow diagrams in order to mitigate operational risk. Tested and measured the impact of assumption and model changes on a quarterly basis. Performed actuarial loss reserving and forecasting analyses for various self-insurance programs. Successfully designed and implemented customized actuarial and statistical models to meet clients requirements. Calculated unpaid claim reserves, premium deficiency reserves, and other liabilities for yearend. Summary : Experienced and inquisitive business professional with a passion for technology and excellent communication skills. Knowledgeable in systems testing, competitive market analysis, data acquisition, and organization. Seeking a position in business analysis, product management or project management. Assisted with product and rate relativity analyses, health care plan pricing.Quoting, and rate calculation analysis. Conducted and coordinated system integration testing. Utilize data mining tools including Microsoft access to obtain data for analysis. Prepare and submit state department of insurance required quarterly filings of rates and development methodology. Effectively problem solved and evolved processes during a highly volatile. Communicated frequently with underwriters as well as sales to assist in specific plan pricing as well as risk selection among groups. Conducted competitive analysis in order to better target and select potential. Objective : Detail and goal-oriented analyst with strong quantitative analysis skills. 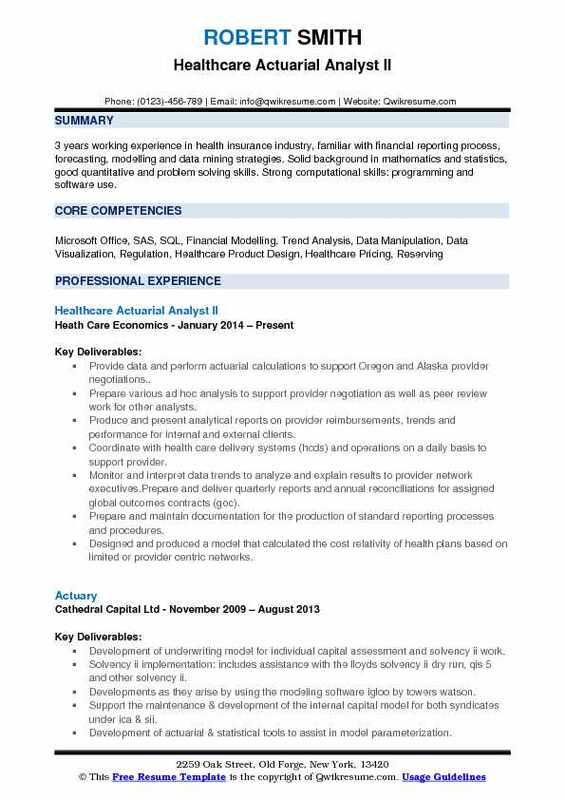 Fast learner and critical thinker with excellent computer and software skills to support business objectives. Problem solver who can apply strong ethics to challenging tasks to full completion. Facilitated quarterly and monthly D&O Insurance pricing, reserving, premium and loss analysis, exposure and limit analysis on policies written on commercial, financial and international sectors with book value near 110. Performed and updated quarterly industry-wide claims filing and loss frequency/severity analysis of data from 2004 to present across almost 70 industry sectors and 7 major stock exchanges using excel pivot table, array. Reviewed around 10 new business programs and ran the analysis on historical premium and loss using actuarial. Models including loss development, born Huet Ter-Ferguson and cape-cod reserving models to project the ultimate return of the new program; directly reported to an actuarial head and underwriting head and provided. Worked with compliance and accounting team to complete state rate filing documents for 7 different states. Assisted ad hoc projects as needed with underwriting, claims and IT department. Performed fundamental analysis on 10+ companies' financial statement, valuation and equity performance. Objective : To obtain a financial analyst position to utilize my Retirement & Risk Solutions skills and knowledge in a challenging and progressive environment that also allows for future advancement. Performed pension and postretirement benefit plan actuarial valuation, including data reconciliation, funding, and accounting reports as well as government forms, prepared benefit calculations for current employees, new retirees and annual benefit statements for vested participants;. Adjusted and updated future employer contribution rate developing models based on various scenarios;. Participated in new client pursuits, including a request for proposals (RFP's), request for qualifications (RFQ's) preparation, preliminary reserve adequacy analysis, and engagement scoping. Accomplished claim data manipulation, payment pattern estimation, and actual versus expected exhibits;. Performed loss trend analysis, modified and developed cash flow projection model to assess the liquidity of clients insurance operations, wrote VBA codes to automate some tasks;. Analyzed past losses using ldf, born - Ferguson, generalized cape code (paid loss, incurred loss, etc. ), and loss ratio method to estimate reserve need for special accounts;. Attended annual board meeting, assisted consulting actuaries with client communication and report presentation. 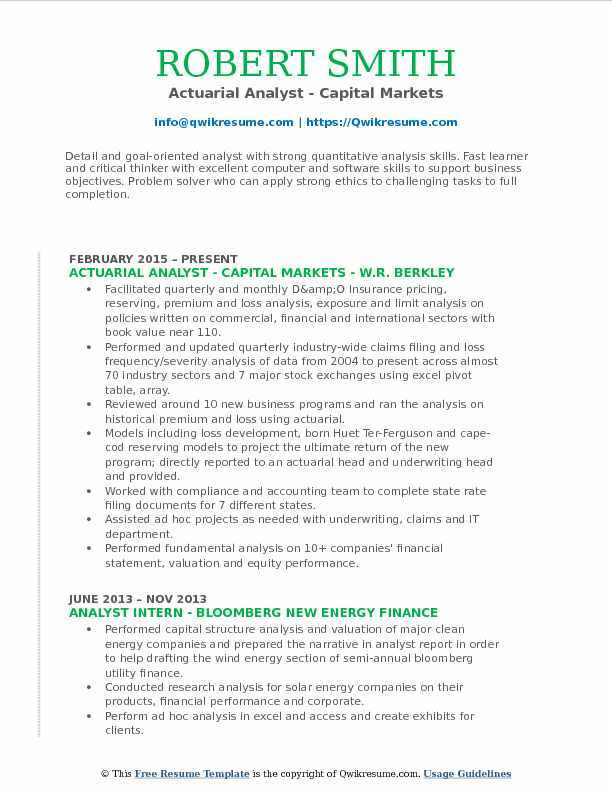 Objective : Near-ASA with five years of actuarial consulting experience with private and public pension/OPEB plans. In pursuit of attaining Fellowship in the Society of Actuaries and Enrollment by the Joint Board ACTUARIAL EXAMINATIONS Completed all Society of Actuaries Preliminary/Associate-ship Examinations and VEE. Extensive experience as designated analyst in the actuarial valuation of public other-than-pension. Postemployment benefit (opeb) plans for over 30 new England municipal clients. Preparing opeb actuarial valuation reports for disclosing and summarizing evaluation results. Undertaking special projects as requested by clients, including plan redesign and cost estimates, and projections under various funding scenarios. Setting up initial valuation models for opeb plans of newly acquired clients. Replication/conversion of opeb evaluations from prior valuation modeling systems to approval. Supporting internal firm-wide research and development teams, including mortality assumptions review. Performed special studies including benefit adequacy, plan redesign, potential acquisition cost, future liability and expense modeling. 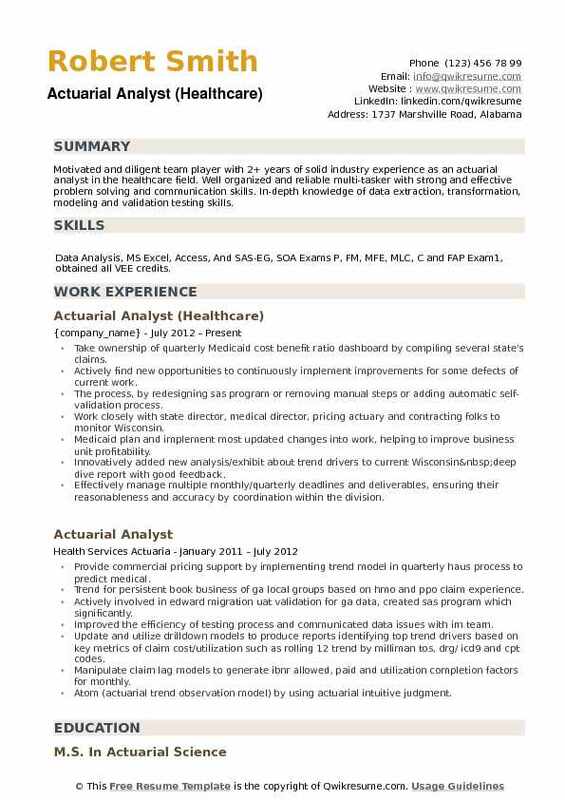 Headline : Motivated and diligent team player with 2+ years of solid industry experience as an actuarial analyst in the healthcare field. Well organized and reliable multi-tasker with strong and effective problem solving and communication skills. In-depth knowledge of data extraction, transformation, modeling and validation testing skills. Skills : Data Analysis, MS Excel, Access, And SAS-EG, SOA Exams P, FM, MFE, MLC, C and FAP Exam1, obtained all VEE credits. Take ownership of quarterly Medicaid cost benefit ratio dashboard by compiling several state's claims. Actively find new opportunities to continuously implement improvements for some defects of current work. The process, by redesigning sas program or removing manual steps or adding automatic self-validation process. Work closely with state director, medical director, pricing actuary and contracting folks to monitor Wisconsin. Medicaid plan and implement most updated changes into work, helping to improve business unit profitability. Innovatively added new analysis/exhibit about trend drivers to current Wisconsin deep dive report with good feedback. Effectively manage multiple monthly/quarterly deadlines and deliverables, ensuring their reasonableness and accuracy by coordination within the division. 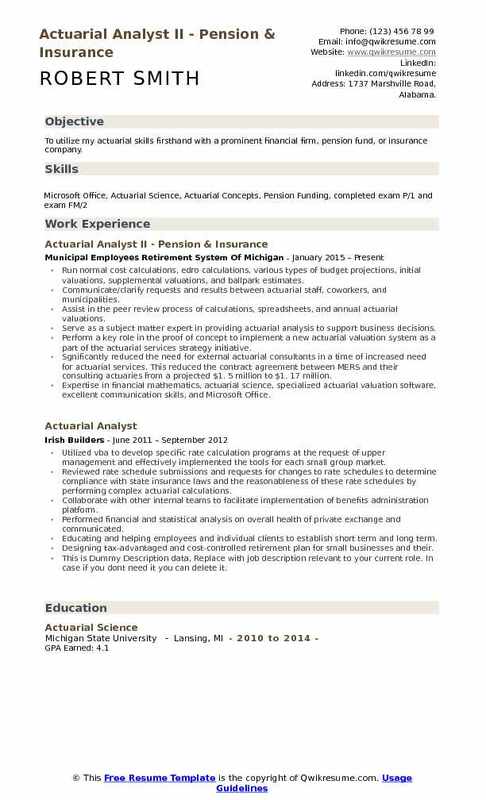 Objective : To utilize my actuarial skills firsthand with a prominent financial firm, pension fund, or insurance company. Run normal cost calculations, edro calculations, various types of budget projections, initial valuations, supplemental valuations, and ballpark estimates. Communicate/clarify requests and results between actuarial staff, coworkers, and municipalities. Assist in the peer review process of calculations, spreadsheets, and annual actuarial valuations. Serve as a subject matter expert in providing actuarial analysis to support business decisions. Perform a key role in the proof of concept to implement a new actuarial valuation system as a part of the actuarial services strategy initiative. Sgnificantly reduced the need for external actuarial consultants in a time of increased need for actuarial services. This reduced the contract agreement between MERS and their consulting actuaries from a projected $1. 5 million to $1. 17 million. Expertise in financial mathematics, actuarial science, specialized actuarial valuation software, excellent communication skills, and Microsoft Office.